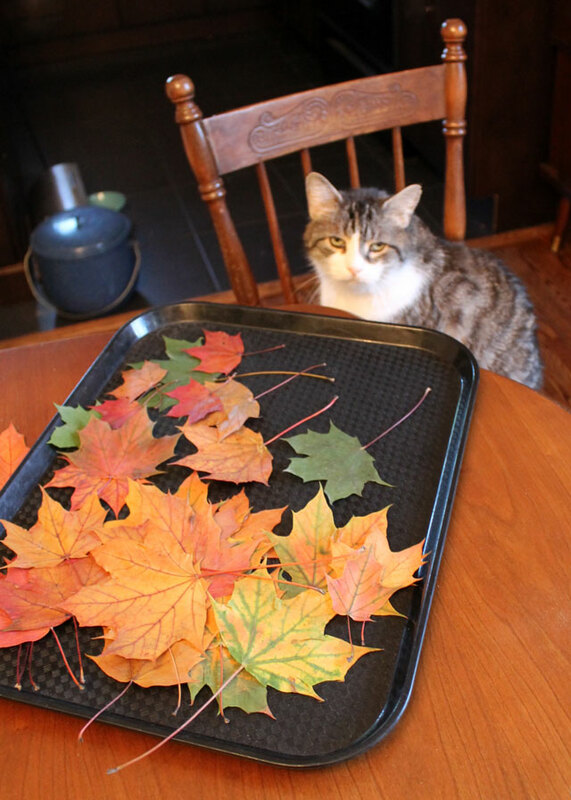 After I saw that the brightly coloured leaves of one of the maple trees in our neighbourhood had begun to fall, I went out and gathered up a bunch and stuck them between the pages of a magazine. I actually did this more than once, because every time I passed the spot I noticed just one more leaf that was so pretty that I had to have it. And then there was another, and another and so on. It was only when I opened the magazine on the weekend and took the leaves out, that I realized that I had collected over 85 leaves. 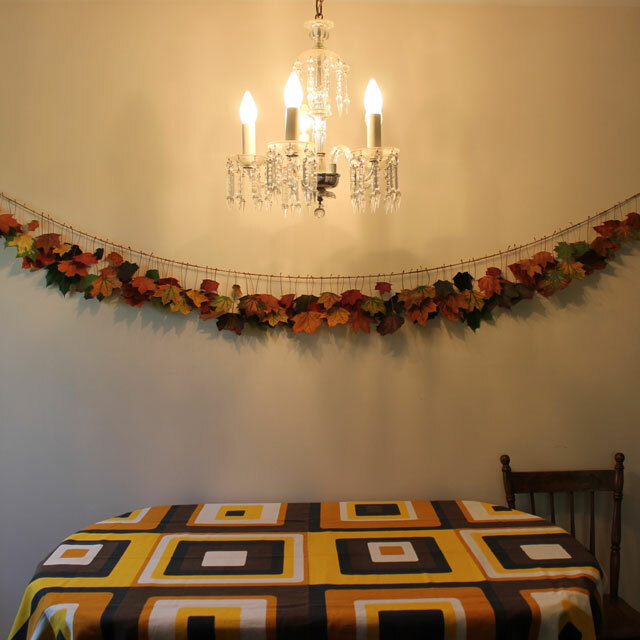 Here is how I made a garland with them. You certainly don't need as many leaves to make one too! Supplies : Twine, a crochet hook - size 5 (optional ... the chain is easy enough to make by hand), some maple leaves. (1) To prepare the leaves, gather when they are very fresh and pliable. Make sure to select leaves that have the entire stem still attached, including the bit at the end where the stem is wider where it was attached to the tree. This part should be intact if the leaves fell off the tree naturally, but if it has been broken off it won't work for this particular project. Place them between the pages of a magazine or newspaper, and then put a weight on top such as a pile of books. Leave them to dry out completely; it takes at least a week. 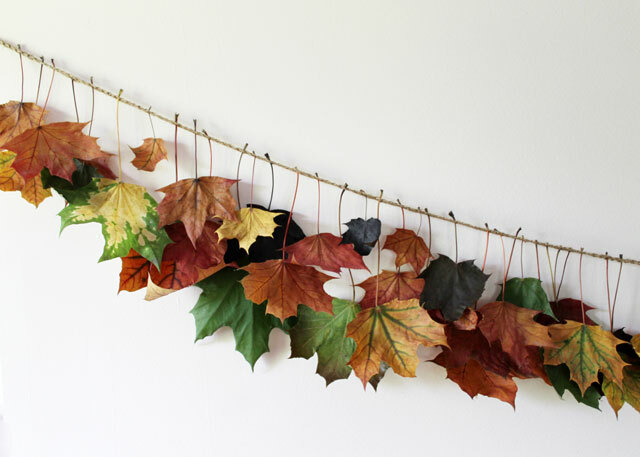 Alternatively : if you want a decoration for a party, that you don't need to last, you could make this with fresh leaves a few hours before your event. 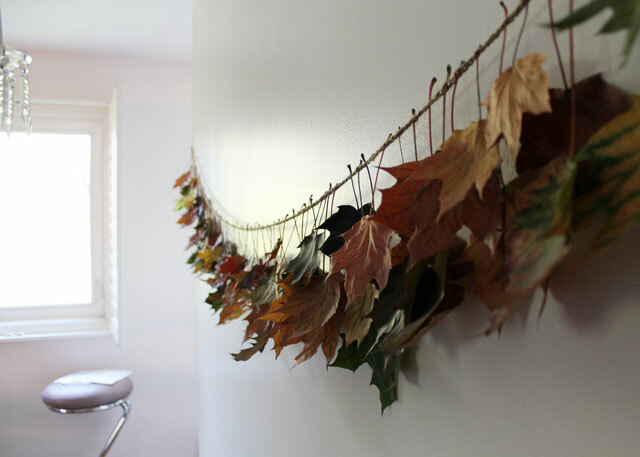 The leaves will eventually curl up but it would look good long enough for your gathering. This would be great for a Halloween party decoration. 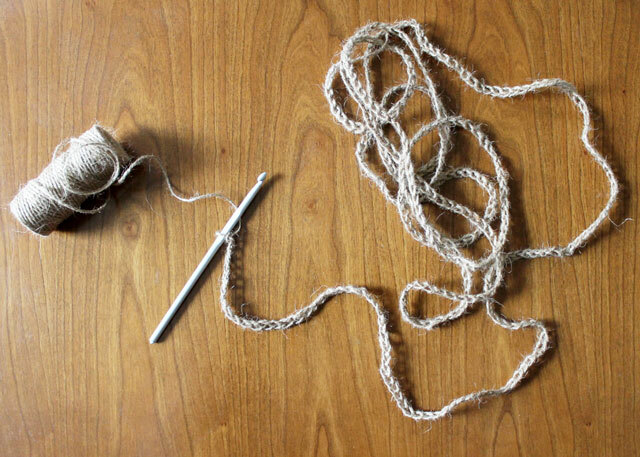 (2) To prepare the the cord onto which the leaves will be attached, you have to make a chain, either by using a crochet hook, or by hand as described in this post. You want the stitches to be fairly loose because you'll be hanging the leaves by passing that wider end part of the stem through the holes, but if the stitches are too loose the leaves won't stay. Make it as long as you'd like with the understanding that it will stretch a bit, and that a more lovely garland will dip down in the centre. My chain was 350 links long, for a garland that will hang on a wall that is 7 1/2 feet wide. (3) Hang the cord. I have two small nails in the walls but you can use hooks or tape. The garland will be relatively fragile, so consider this when you choose your location. 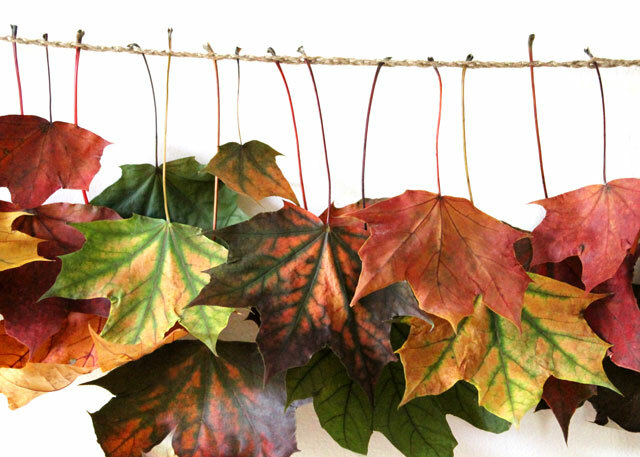 Also, as dried leaves will burn, make sure it won't be hanging near candles. 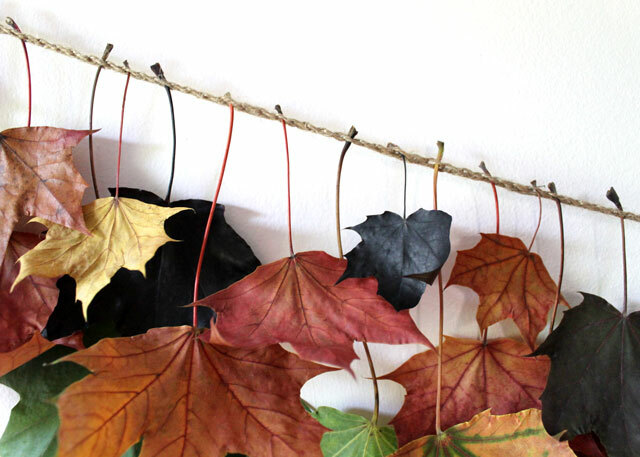 (4) Begin attaching your dried leaves, by passing the wide end of the stem through the holes in the chain. They stay in there very well. I started by sticking in the largest leaves and filled in the garland with smaller ones, spacing out the various colours and natural patterns. (5) The number of leaves you use is up to you. I wanted mine to be very full so I used 85 leaves, but it also looked cute at the beginning after I'd only put in about 10. Note : The leaves will probably curl up a little, as you can see in these pictures, no matter how long they have stayed within the pages of the magazine. 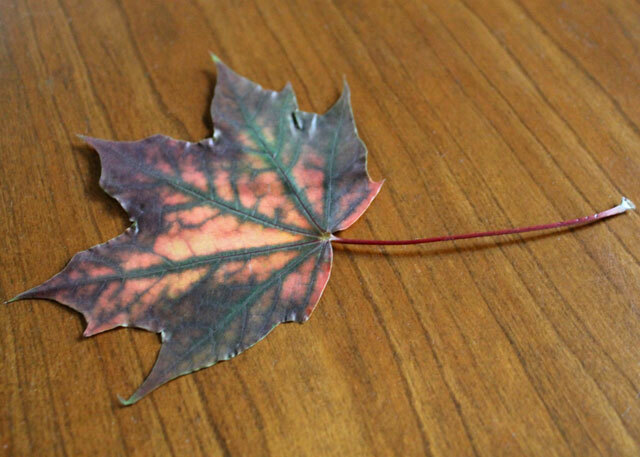 That is unavoidable for most kinds of maple leaves, (although there is one around here that will drop bright crimson leaves sometime in November, that I used to make this display last year ... those leaves stayed completely flat after drying). There is a way of avoiding having them curl, by soaking them in a glycerin and water solution but that adds what seems like a lot of extra work for what is meant to be a temporary decoration, and I don't mind the natural look of some curling. I would advise that you leave them between the pages right until you're ready to put them in the garland. I found that they curled up within a few of hours after I'd removed them and made the garland, but then they settled ... what you see in these pictures is what they look like a few days later. 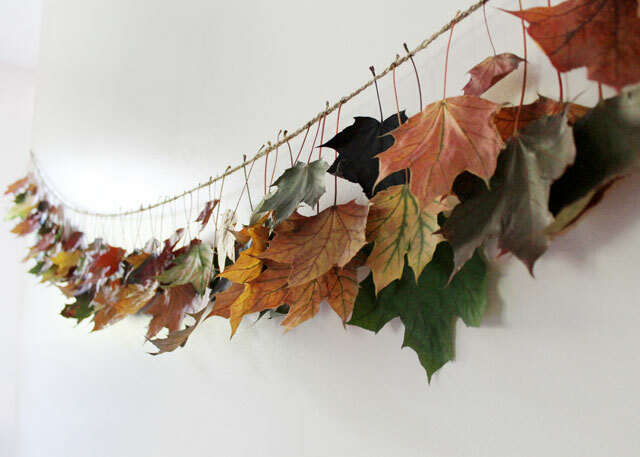 I expect the leaves to look like this until I take the garland down after Canadian Thanksgiving, which is this weekend. That said, if you do plan to display your garland for longer than a couple of days you do want to go through the process of pressing them while they dry as described, otherwise they will become unattractively curled as they dry out, as shown in the photo below. 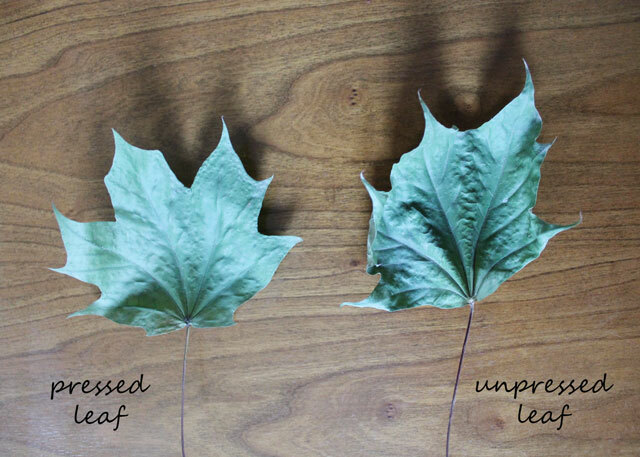 Both these leaves are from the same tree and were brought inside at the same time. 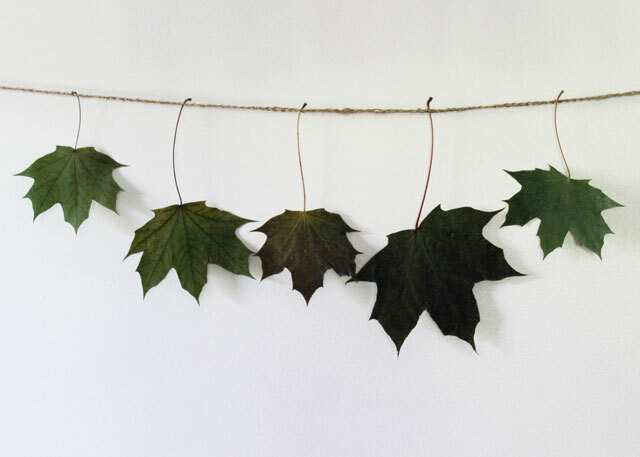 As this is a temporary decoration I'll be throwing the leaves into the compost after taking it down and saving the cord to use for another purpose or to make a leaf garland again next fall. Or, since it's only a chain, you can unravel easily and reuse the twine. Thanks a lot for taking a look. 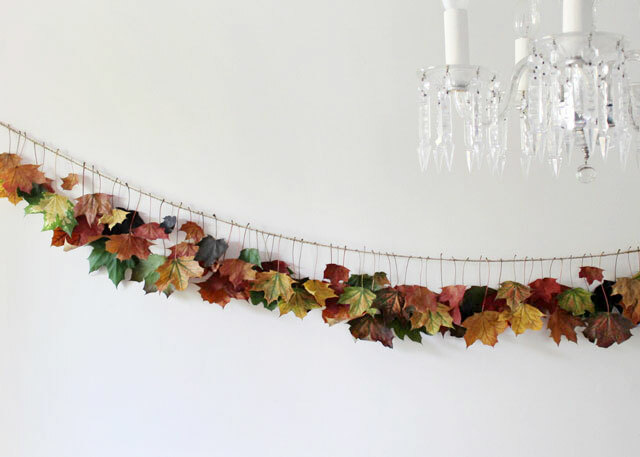 Please let me know if you make a leaf garland too! this is SO beautiful, and I especially love that it is entirely compostable, once you are done with the garland, and it looks so incredibly beautiful! 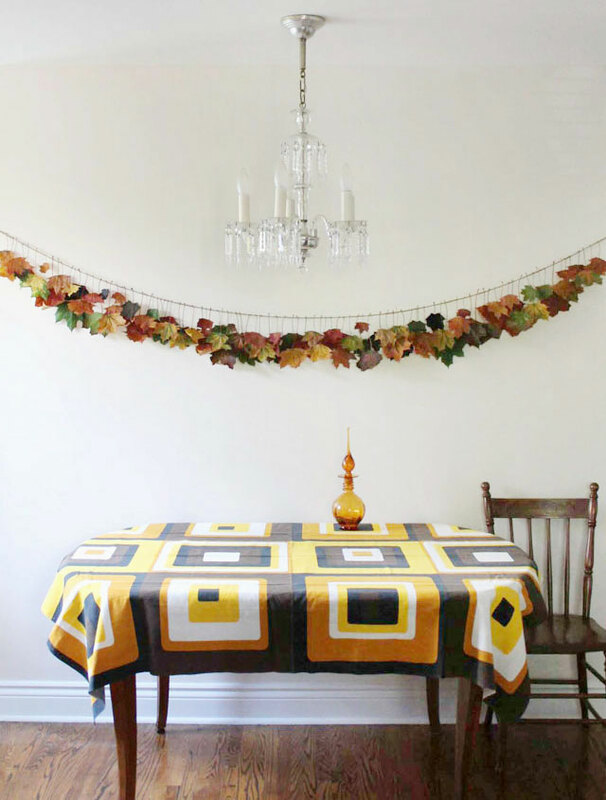 what a fabulous idea for a thanksgiving decoration. Thank you Julie. With minimal space for storing decorations, I like the idea of just composting it after the season is over and saving the cord to reuse. I’m happy you like it! I know, it is so hard to impress Eddie! I’m glad you like the garland. The tablecloth fabric would make a cool dress. I could see you wearing it. This is so beautiful !! WOW!!! Looks awesome!!! And the photos are stunning! Thanks Hollie. I guess there aren’t an abundance of coloured maple leaves where you are, so on this one you can live vicariously through me, just as I do for the nice weather you guys get to enjoy all winter long! That’s great Corinn. Hope your garland turns out nicely! 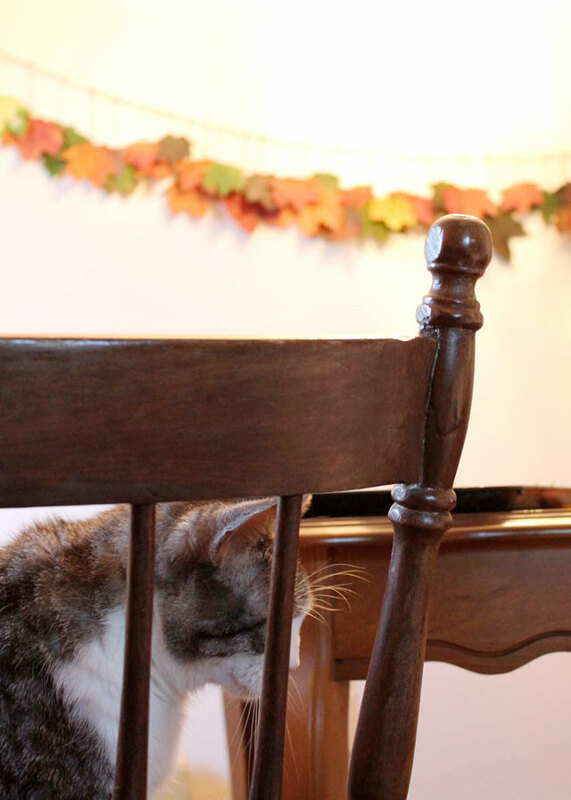 The leaves are finally dry and we put the garland together over the sofa. I think it looks lovely and very autumny! Thanks for the inspiration. That’s great Corinn. Thanks for letting me know you made one. I’m glad it turned out nicely for you. I still have ours up and it’s still looking good, so hopefully yours will last too. Thanks Kyla. I’ll drop by your link-up party! 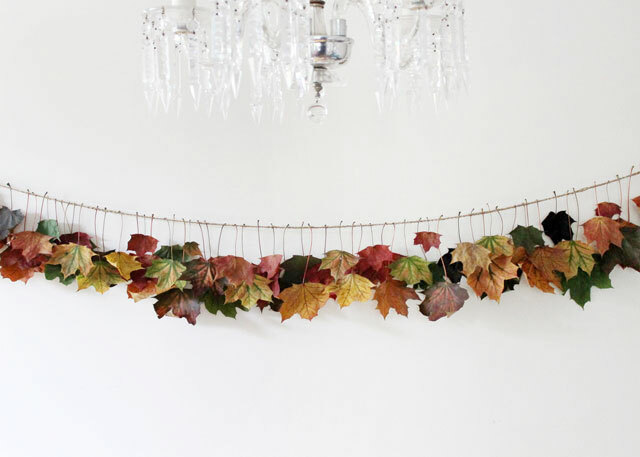 I love your fall garland. I was also very inspired by the leaves this year, so I painted leaves in Christmas colors to make garland for my Christmas tree. 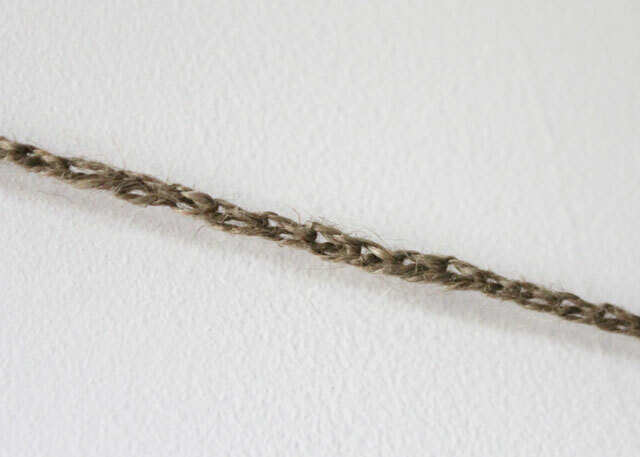 I also tried braiding some dried out leaves from one of my shrubs for the cord. It didn’t work so well. For now, I am re-purposing some plastic rope. I love your ideas!! What an awesome idea! Simple and impressive! I collect leaves every fall to make bouquets, but the bouquets look too regular. Now I know what I will do next time! 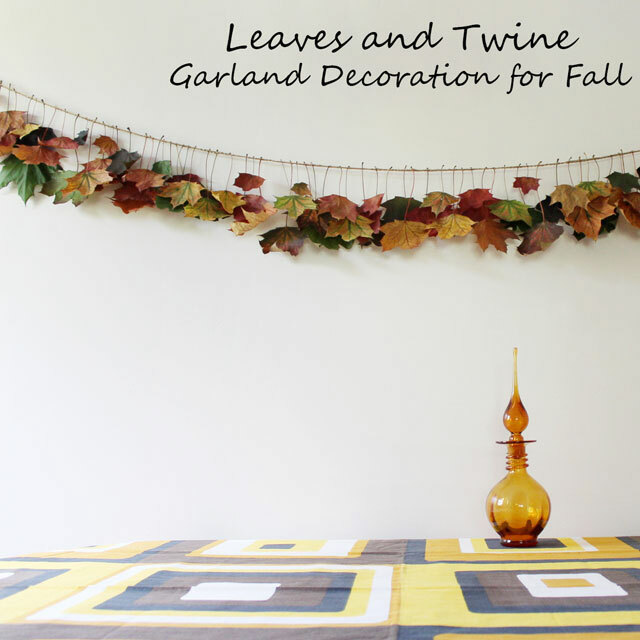 I’m so glad you like the garland and thank you for including it in your post! This looks awesome! Thanks for sharing! Hello and thank you for visiting. I live in Toronto, Canada, and write about the arts, going out, local history, urban wildlife, entertaining, cooking, making things and collecting vintage. I take a lot of pictures around the city. If you see yourself in one and would prefer it be taken down, no problem. Please contact me by email. ©2018 - All rights reserved. All photographs are my own, unless stated. In most cases, others are welcome to use them but only with credit, including a link to my site when published anywhere online. Please contact me if you would like high resolution versions.